Isoflavones vs. Steroids. Vegetables vs. Animals. “Doesn’t soy contain estrogen?” People ask me this question a lot, especially when I mention that I don’t eat dairy. I call this “the milk talk”. I’ll apologize in advance – I’m a biochemist so that will color my explanation… or maybe make it so colorless that you fall asleep. Anyways, what people are talking about when they say soy has estrogen in it is that soy contains compounds called isoflavones and flavones. All plants have them. 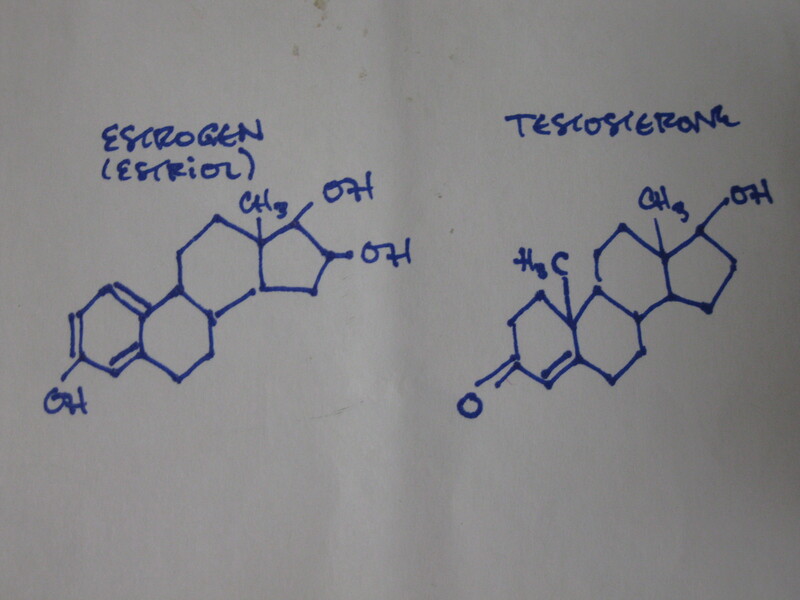 These compounds are ‘estrogen-like’. 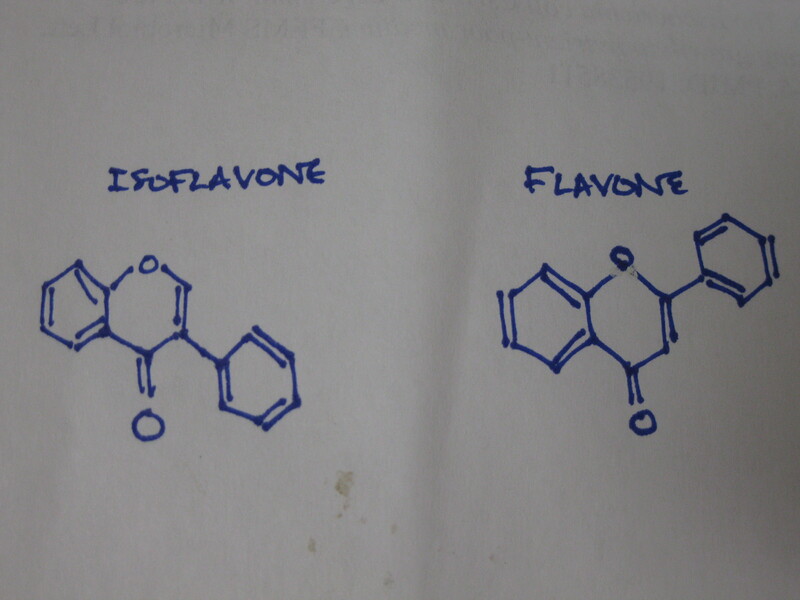 This is what isoflavones and flavones look like in a simple chemist’s line drawing (think: stick figures for molecules, they don’t actually look like that). You don’t need to know what any of this means, just note the similarities and differences between all 4 drawings in this post. Isoflavones and flavones aren’t one specific compound: they’re a group of compounds with similar structures, not unlike the group called steroid hormones. Estrogen and testosterone are both steroids. I hope you’ll notice that estrogen and testosterone are much more similar to one another than to the flavone or it’s isomer (OMG you just learned some organic chemistry!). You might also know that estrogen and testosterone have very different effects on the human body: one makes you grow muscles and chest hair and the other makes you grow breasts and smooth skin. If you surmise that flavones and isoflavones have different effects too, then you’re correct: there is interest from the scientific community in flavones and isoflavones as treatments for cancer (and heart disease, diabetes, and osteoporosis). Research suggests that various compounds in the group of known isoflavones and flavones are effective for treating and preventing the very cancers that estrogen and testosterone are known to promote. Additional fun fact: withdrawal from estrogen causes PMS. Withdrawal from testosterone causes ‘roid rage. Withdrawal from isoflavones and flavones has no documented symptom. So you might be asking yourself, “Why is she going on about estrogen?” or maybe even. “well, dairy milk doesn’t have any hormones in it. 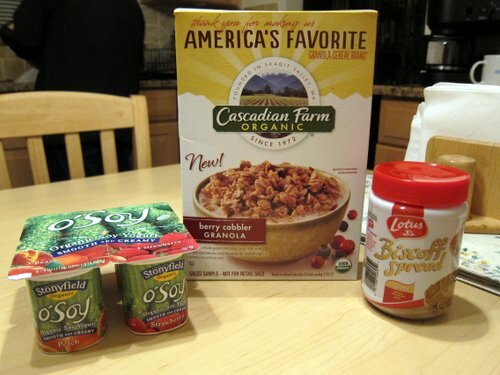 I buy organic.” Really? Are you sure about that? Where do you think dairy comes from? Cows. All cows: male, female, young, old? Female cows. How do you get a lady cow to make milk: motivational posters? Nope, you impregnate them.Then their levels of estrogen skyrocket, but not just estrogen. Progesterone and eventually prolactin will also show up in a pregnant cow’s secretions: from urine to (you guessed it) milk. But there isn’t very much hormone in dairy milk, right? The concentration doesn’t matter, you don’t need a lot. Why? Steroids (and all hormones) operate in something scientists call “signal cascade”. I would describe it as chemical chain letters: each cell that gets the signal (1 hormone molecule), sends copies to all of it’s closest friends and a few not-so-close friends. If you’re really thinking, you might ask yourself, “Doesn’t pasteurization destroy it?” Well, pasteurization occurs a no more than 72C/160F (Wikipedia). Dessicated estrol begins to break down at 245C/473F (according to my Merck manual). Just throwing that out there. This is what I’m really getting at: if you’re worried about the estrogen-LIKE compounds in soy, why haven’t you considered the actual estrogen (and progesterone) secreted by the [recently] pregnant cow whose milk you’re drinking? Anyways, I prefer almond milk – fewer calories.